This article is about the Hybrid Theory demo album named "Demos". For a list or demos, see List Of Available Demos. 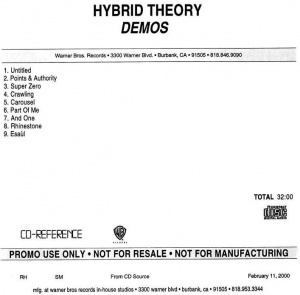 Demos, Hybrid Theory 9-Track Demo or simply 9-Track Demo (as known by fans) is one of many CDs compiled by Warner Bros. Records to promote Linkin Park (Hybrid Theory at the time) before the release of their debut album. The CD contains demo versions of songs from the album. The 9-track demo was the first source for many working titles and its tracks became the most well-known and widest circulated Hybrid Theory demos. After being availble in varying quality around the internet for many years, community member Energy obtained a copy of the CD and made a high quality rip available on LPFuse for free download as a Christmas present in 2004. It's unknown whether the spelling of "Super Zero" on the tracklist can be attributed to the band themselves or to miscommunication with the label. The fact that the CD has a "Promo Use Only" warning indicates that it was used by Warner Bros. Records as a sampler to promote the band before the release of their debut album, taking the best demos of each song and combining them. Because of this, the date on the CD doesn't necessarily relate to when the demos were recorded. The original CD sold on eBay in 2004 dated from January 7, 2000, but the most common copy among collectors dates from February 11, 2000. The version of "Untitled" on this CD was recorded after the version on the LP Underground 11 CD. According to Mike, his original beat for the song was scrapped and they had Rob record a new one right before they went into the studio. "Points & Authority" came from a demo called "Oh No", which was released in the LP Underground X: Demos CD. The version on this CD is believed to be recorded after the demo version on the LP Underground 12 CD (which is similar to this one but still different). "Super Zero" is different from "By Myself" from the 2-track demo version, with significantly different lyrics and Mike whispering "So, what do you think?" at the beginning. "Crawling" was originated from a demo called "Blue". "Carousel" and "Part Of Me" both features different vocal takes, with "Part Of Me" having a shortened intro (similar to the Hybrid Theory EP version). The CD features the earliest available recording of "Rhinestone" with Chester Bennington on vocals. The song was completely reworked with new instrumental and new lyrics in comparison to the Xero version. "Esaùl" is different from the 2-track demo version, having some different lyrics. "And One" had it's audio channels switched and is identical to its counterpart on the 8-track demo CD. This CD offers some insight into where Hybrid Theory was as a band at this point, still working on their debut album. Songs from the Hybrid Theory EP were still in consideration for the album, and the band were starting to consider some Xero songs for it too. This page was last edited on 24 January 2018, at 16:22.